The Economic Policies Research Unit (NIPE) is pleased to announce its 16th Summer School on “Regression Discontinuity Designs”. 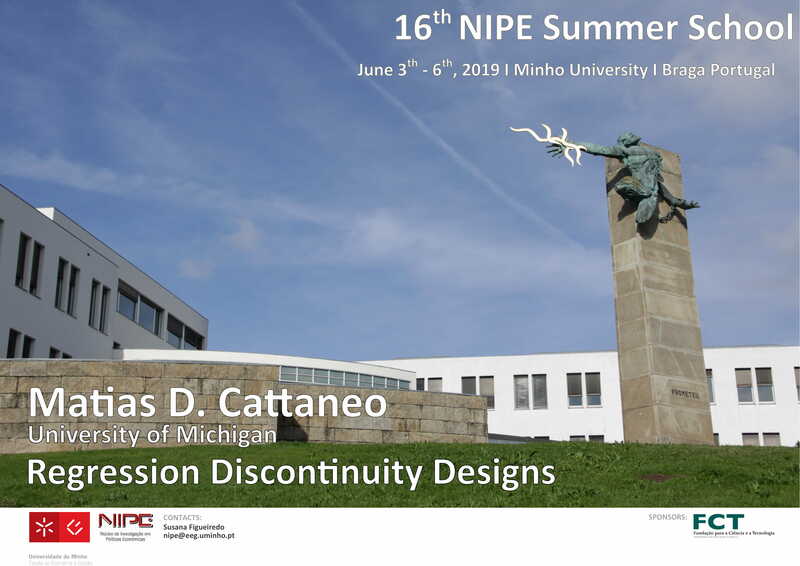 The course will be taught by Professor Matias D. Cattaneo (University of Michigan) at the University of Minho, School of Economics and Management, Braga, Portugal, between June 3rd and June 6th 2019. The course provides an introduction to standard and recent methodological developments in the analysis and interpretation of regression discontinuity (RD) designs. It focuses on methodology and empirical practice. The course will employ several empirical illustrations, which will be analyzed using Stata. The course will discuss some topics such as Identification, Falsification, and Conventional Methods, Modern Continuity Based Methods, Modern Local Randomization Based Methods. On the last day of the Summer School, June 6th, Professor Matias D. Cattaneo will be presenting a seminar.